This event is a FREE carnival-style walk through celebration of science and our state! It is open to the whole family, and no pre-registration is required. Multiple stations will introduce attendees to a variety of hands-on experiments and displays about things made in North Carolina. Activities include meeting and interacting with local beekeepers, participating in the making of Mentos geysers, and touching real NC fossils. Participants can also learn about diverse organisms that are all “made in NC”, extract DNA from NC grown strawberries, and plant their own NC plant. Since NC is ”first in flight”, visitors can try their hand at making and flying paper airplanes. 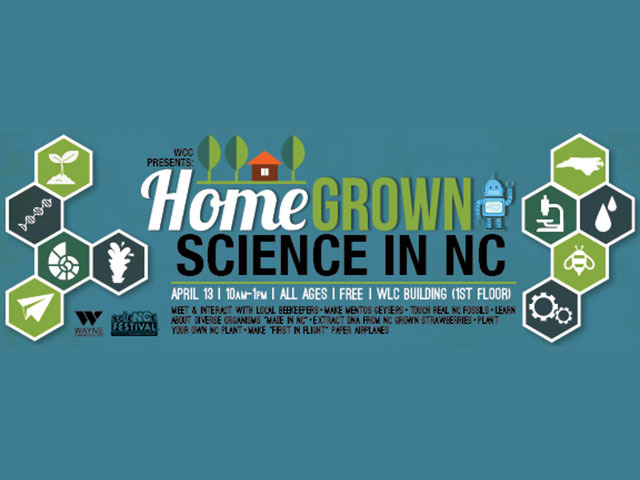 Come out and experience the science behind North Carolina with us first hand!